“Caine is an 8 year member of Plymouth County 4-H. She is a member of the Plymouth County 4-H Council, the Northwest Iowa Area 4-H Council, and the Iowa State 4-H Council. She has volunteered at the Iowa State Fair, attended Iowa 4-H Legislative Day, and is a State Fair Buy-a-Brick” donor. 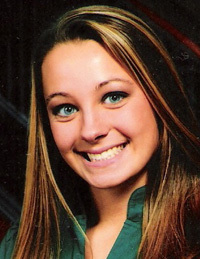 She has attended the Iowa State 4-H annual conference four times in her high school career. She has exhibited champion projects and given educational presentations at the Iowa State Fair. In the community she is an American Red Cross Life guard and swim instructor, American Heart Association volunteer and “Sweetheart” advocate, is an Akron Care Center Animal Visitation volunteer and volunteered with RAGBRAI. She is active with the Plymouth County Barn Quilts Project. Caine is the Children’s Bell Choir Assistant at her church. In June she was elected as Governor at the 64th session of the Iowa American Legion Auxiliary Girl’s State at ISU in Ames. In school Caine is involved in student council, band & choir, cheerleading, volleyball, golf, individual and large group speech plays, Lakeside Lab Project, Akron Community Service Day, Akron-Westfield Leadership Night and the Akron-Westfield Senior Citizen’s Fun Night. In July Caine was chosen as the Plymouth County Fair Queen. She then went on to compete at the Iowa State Fair and on August 15th was chosen as the 2009 Iowa State Fair Queen competing with 103 other candidates.